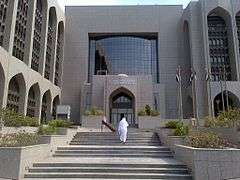 The Central Bank of the United Arab Emirates (Arabic: مصرف الإمارات العربية المتحدة المركزي‎‎) is the state institution responsible for managing the currency, monetary policy and banking regulation in the United Arab Emirates (UAE). It was established on 19 May 1973 as the United Arab Emirates Currency Board. This followed the creation of the UAE as an independent state in 1971. The original purpose of the UAE Currency Board was to issue an independent currency for the new state to replace the existing currencies in use: the Qatari riyal and the Bahraini Dinar. The new UAE dirham entered circulation on the same day the Currency Board was established. At this time, the Currency Board of the UAE did not have full central bank powers. It was mandated to manage the currency and the country's gold and foreign exchange reserves, but did not have regulatory authority and was not empowered to manage the UAE's monetary policy. On 10 December 1980, Union Law No. (10) was passed, which established the new Central Bank of the UAE, replacing the former Currency Board. The Central Bank of the UAE has powers to issue and manage the currency; to ensure the stability of the currency; to manage the UAE's credit policy; to develop and oversee the banking system in the UAE; to act as the Government's banker; to provide monetary and financial support to the Government; to manage the UAE's gold and currency reserves; to act as the lender of last resort to banks operating in the UAE; and to represent the UAE in international institutions such as the International Monetary Fund, the World Bank and the Arab Monetary Fund. The Bank is overseen by a Board of Directors, comprising seven members. The composition of the Board is defined by the UAE Union Law No 10 (1980) which provides for a Chairman, Vice Chairman and the Governor (all of whom have the rank of Minister) and four other members. Each member is appointed by a Union Decree after approval by the UAE Council of Ministers, and serves for four years. Members of the Board are prohibited from serving on the board of any commercial bank operating in the UAE, nor may they be serving members of the UAE Federal National Council or be Ministers of Cabinet status. Mubarak Rashed Al Mansoori, Governor of the Central Bank, was ranked #3 on the Public Investor 100 for 2016. This department is responsible for regulatory oversight of the UAE banking industry . A significant part of the department is located in the Bank's Dubai office, since the banking industry in the UAE is largely concentrated in this city. The scope of its regulatory mandate includes domestic banks, foreign banks located in the UAE as well as finance house and other financial institutions, including financial advisory practices. In June 2013, there were 23 domestic banks and 28 foreign banks in the UAE. The department's functions include the issuing of licenses to banking institutions, setting banking standards and regulations, and monitoring compliance. The department is also responsible for liaison and co-operation with international standards bodies and banking organisations, notably the Bank for International Settlements, the Financial Action Task Force, the International Monetary Fund, and the World Bank. This department is responsible for issuing and managing currency notes and coins in the UAE. It also manages the UAE's electronic payment systems. The printing of currency notes has historically been contracted to the specialist UK security printer De La Rue; however in May 2013 the Central Bank of the UAE and the Emirates Investment Authority jointly announced the intention to establish a mint in the UAE to meet the Central Bank's entire requirements for of printed currency notes. This department processes economic data which it publishes in a series of publications, including the Central Bank's Annual Report, the Economic Bulletin and the Statistical Bulletin. The department also liaises with its counterparts in international institutions, principally the International Monetary Fund and the Arab Monetary Fund, as well as co-ordination with other sources of data in the UAE such as the Customs agency and Government Ministries. This department covers a number of back office functions. These include managing the Bank's library, archiving of records, purchasing, buildings maintenance, and security guards. This department has three main areas: Treasury Operations, Accounts and Management Information. Treasury Operations is part of the back office function of the Treasury Department (see below). This department is responsible for managing and investing the Central Bank's assets and reserves. These assets principally comprise deposits from the UAE Federal Government; deposits form commercial banks who are required to maintain a certain percentage of their assets as liquid deposits with the Central Bank; dirham-denominated certificates of deposit; and currency in circulation. The department is organized into four main sections: Capital Markets, Money Markets and Foreign Exchange, Certificates of Deposit, and Back Office Settlements. This department undertakes audit functions across the following areas. Payment security - checks are performed on all transactions that involve the transfer of funds from accounts maintained by the Central Bank. IT Security - the department is responsible for the security of sensitive functions on all electronic systems. Post audit - the department reviews financial expenditures undertaken across the Head Office and branches and reports any instances of non-compliance. ↑ "Mubarak Rashed Al Mansoori". Sovereign Wealth Fund Institute. Retrieved 2016-10-23.